Posted: Sun Feb 04, 2007 10:55 am Post subject: Vapour trails, contrails or chemtrails? Fact or fiction? The first peer-reviewed journal article focused on so-called “chemtrails” concludes that this long-held conspiracy theory is nothing but fog and air. Ive been asked on behalf of David to make the following observations known to a wider audience. It would appear that there is a lot of Chemtrail activity around these parts of late. On a personal note, as I was cycling home the other evening, I noticed the long trailing plumes against the moon. The following morning we get the fog. This morning it would appear that exactly the same thing has happened again. Its quite frosty here today, which in theory would suggest that the skies be chrystal clear. We want to believe that this is simply the result of perhaps an overactive imagination, but we strongly suspect not. What on earth is going on ? My mate and I were walking on the (Blackpool) beach on Thursday evening shortly after the fog fell. We have both got marine navigation qualifications, ergo have studied meteorology. Also, he is a lifeboatman and has a 'feel' for weather. We both agreed that the fog was a sure sign that there would be frost in the morning, there being moisture in the air and an expected low temperature. I have been watching trails for many years and my observations are on hold for the time being as I have become aware that the more pervasive trails seem to occur only during certain atmospheric conditions. That isn't to say that I am not suspiscious - there still isn't any evidence that such trails existed before c. 1983 - but all the evidence is circumstantial and it is too easy to leap to conclusions. 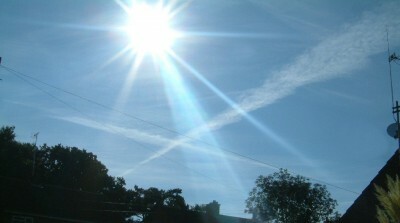 the whole thing with the pathogens, blood, barium and aluminium in these trails is a worrysome development. What u rekon about morgellons, real or not real? us gov admitted in an article in the guardian last saturday that they are develpoing plans to place mirrors in space and leave cloud trail in the sky to reflect the sunlight in an attempt to stem global warming. the same day blaire leaves that meeting in swiss mountains saying that they have made great progress on plans to stop global warming. 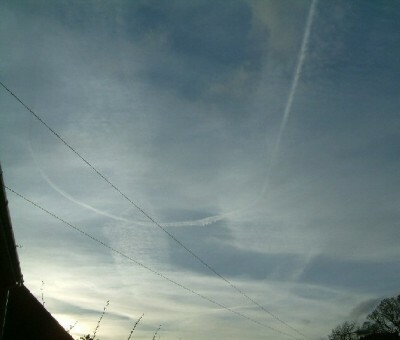 my bet is they have been testing it out chemtrails for a while now and have now decided to make it abit more public. when i spoke to the sun about a year ago about this i was called a nutter and a conspiracy theorist and then hung up on. now its in the guardian. how times change. open you eyes and see the truth for yourself! if the above is true why the secerecy? i carnt see it being kept from us when they scare us with global warming every day and have been suggesting it for years. Why the secrecy? Seems obvious to me, if you look at what has actually been found in these 'chemtrails' then i rekon what you are seeing is 'them' messing around with our immune system without consent. Hey we are all dumb enough to go and get mercury laced vaccines, why not this? oh yeah, theyre now teaching this in schools! Just curious how the samples were obtained. Today was mad as f*ck sky-wise. I have 4 pics from cam phone showing 4 planes formation flying and BLATENTLY covering the whole area. Within 3 hours the blue sky was gone and the haze I can now spot instantly took over. A group of us who log this stuff thought they had gone to nite shifts only or found a new way to spray minus obvious trails but it seems not. If you can spare 2 mins a day to log your area's activity - pls contact me or jackamo23ATgmailDOTcom as we are databasing this in UK. If this thread was over on CC, I might be allowed to ask what "2 cancers" (airborne) might actually be. And what your source for this info is. But it isn't, so I can't. Shame. I am interested to know which are the several that shouldn't be there? Plus I agree, whatever are 'airborne cancers'? David Boyle, proprietor of the Conspiracies Exhibition in Blackpool. I decline to make any further comment. Posted: Mon Feb 05, 2007 2:23 pm Post subject: Re: Cloudy Skies. These trails are not a figment of my imagination (I wish they where) they are real, they are above me nearly everyday and I really do think we should make people aware of these awful trails... we are penalized for pollution on the ground but nothing is been done about the Air pollution/chemicals comming down on us and our children. The sky just ends up like a white milky mess after these trails have spread into each other throughout the day. 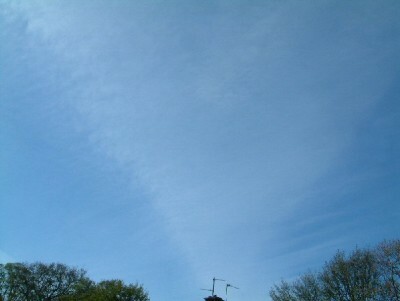 I don't know what they are doing to our health or the enviroment, but IMO it can't be a good thing..
Last picture is courtesy of John from Norwich 9/11 Truth, the rest are what we have taken, all are over Kings Lynn. The bottom pic is the most compelling and if planes were seen in formation I'd start to take it on board but planes follow strict flight paths one at a time. What we need is "Pilots for Chemtrail Proof"
remnants of trails laid by jets what does that tell you? Global dimming by jet exhaust, to what end I don't really know but you really have to be blind not to see it,especially at 6.45 in the morning on a clearish day followed by clouds a plenty and an overcast sky! The "End of days" scenario is a man made phenomenon utopiated. You want to get up to West Yorkshire where the chemtrails were very messy in 2002 and then one or two cloudbusters were lifted and the trails began to break up. How do you know they are not just contrails? I'm not being facetious but do you know the difference between contrails and what are known as 'chemtrails'? Read somewhere that the US Government spends more money on weather control than it does anything else, including war. Thats why the US have taken so long to come into the fray regarding global warming, they didnt put their ideas to stop global warming forward because they knew it doesnt exist, they control all the weather thats why the weather around the world is so messed up. Global warming is like another story to fuel everyday people whilst something more sinister going on in the background is actually the case ^^. Just an off the cuff thought! Global dimming by jet exhaust stuff, to what end I don't really know but you really have to be blind not to see it,especially at 6.45 in the morning on a clearish day followed by clouds a plenty and an overcast sky! Just to add, I made a comment to a work colleage and he said " It's so clear today"
CLEAR FU CKING CLEAR! he obviously didn't notice the obvious residue of whatever, that was and is filtering the suns rays for whatever reason! This is always total ball works. "Since the sun started rising in the northeast and setting in the northwest a month or so ago the weather's been kind of screwy--way too much rain and it's too hot, at least in Eastern N America. Typically, we wake to almost clear skies here in the morning, with heavy cloudcover offshore to the east. By mid-afternoon there are thunderstorms all around us and this goes on for a week or so at a time, with a week-long break of normal skies in between. At this latitude, which is close to the Tropic of Cancer line (the north limit for coconut palms is forty miles north of us), the sun should be rising and setting due East and West this time of year. Before and during the previous axis wobble the moon's orbit became bizarre and erratic but this time it's 'normal.' "
The author seems to be suggesting that, at the time of writing, the sun was rising in the "wrong" place, and that on a previous occasion the moon's orbit became temporarily erratic. Could you clarify this please as, if true, I'm wondering why every news medium isn't screaming blue murder about these truly astonishing astronomical events. 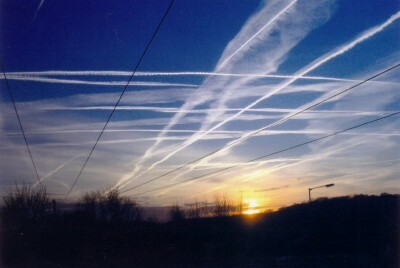 Can someone explain WTF this is all about....you see for a minuite there I thought we were discussing vapour trails. Problem is see, hot air holds much more water than cold air. When the hot jet exhaust mixes with the very cold air at altitude the water comes out of suspension and becomes vapour trails. I`m guessing the health effects are due to the burning of hundreds of thousands of gallons of Kerosene. Some of the by-products from which no doubt get into the lungs of persons who live below high air traffic zones. snowy there is a huge difference between vapor trail (contrails) which are what you describe, they disappear from sight very quickly though and chemtrails which are the trail we all see in the sky now which linger in the air for a long while spreading out into a milky cloud covering. there are a couple of schools of though, one is by will thomas you can look him up he also has a few videos on google video, his main view is that the spraying is done as some sort of bio programme on the populus. then there is the view that this is being done to counter the effects of global warming (it links in with global dimming), by spraying a layer of cloud chemicals they can reflect rays of sunlight back into space. the guardian had a piece on it in sat edition two weeks ago. then there is the view that its to do with weather engineering. all can be found through google. and some of it is very interesting indeed. as of yet i am undecided which way to go as there is just not enough direct evidence pointing to one thing, alternativley it could be all of the above + some more we dont know about. all we do know is that these trail are not normal contrails. the image posted above is from ww2. What they are doing there is, i forget the correct term for it, but they are releasing heavy metals into the atmosphere in order to improve our radar system as the turbulence to the air with the heavy metals is more clearly seen by radar. I see these things all the time. What they are for is another matter. But the reason i know that it is not just the resultant residue of the burning of kerosene is because when they are flying through the air they suddenly start emitting the thicker contrails, then will suddenly stop then start up again. I have even seen them flying in formation then turning around and doing it again. Cannot get anymore blatant than that. I think the term is 'chaff'. I learned about it as a radar/radio mechanic in the Fleet Air Arm but I was only aware of aluminium foil strips being used. I never heard of heavy metals being used.